← Should California expand reservoir capacity by removing sediment? 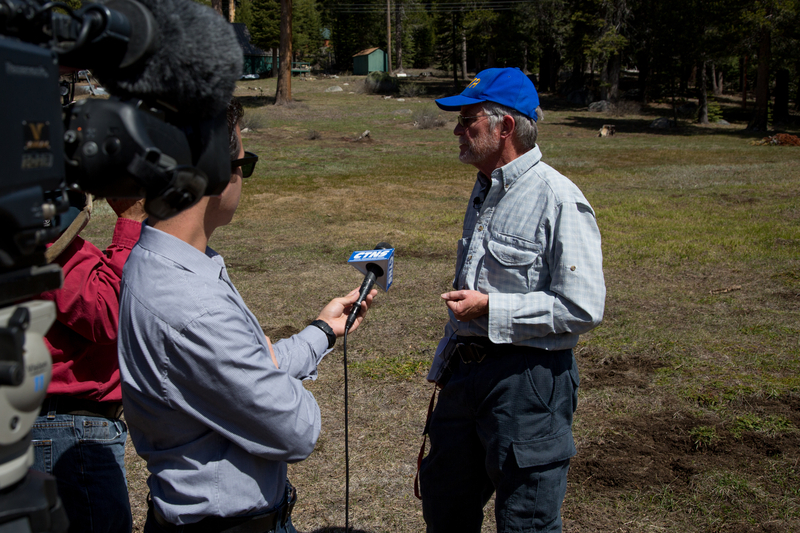 Will California’s drought extend into 2015? Debates over how to manage California’s critically dry water supplies this year have displaced most discussion about water next year. This year’s drought is bad, but another dry year that begins with even lower groundwater and reservoir levels could be much worse. The state’s reservoir storage is already at near-record lows for this time of year, and accelerated overdraft of groundwater — the state’s most important drought reserves — is likely to limit its availability. How likely will next water year be dry? The historical record, imperfect and limited as it is, provides some information on the odds of water conditions improving or worsening. California’s Department of Water Resources divides all water years (October to September) into five “year-types”: Critically Dry, Dry, Below Normal, Above Normal and Wet. This year the Central Valley is Critically Dry; last year was Dry and the year before that was Below Average. Table 1 shows the percent of years from the historical record in each category, and the percent of years in each category if the previous year, like this one, was critically dry. Based on 106 years of record, only 13 percent of years have been Critically Dry. But the odds facing California for next year aren’t as good. 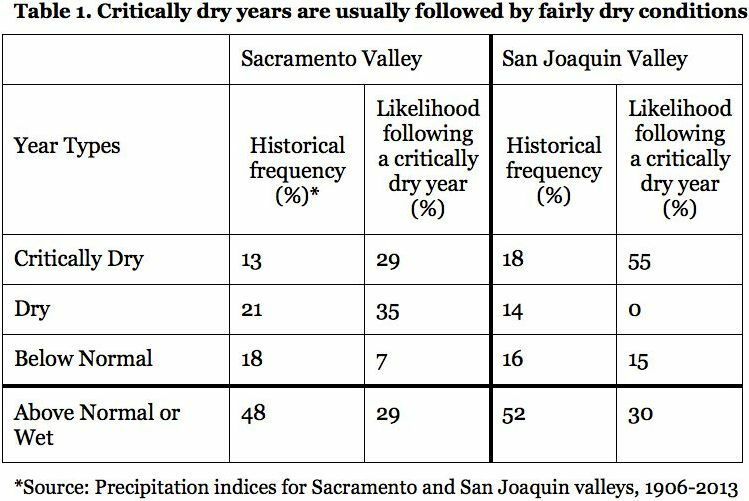 In the Sacramento Valley — the state’s largest source of water supply — there’s a 29 percent chance that the 2014-15 water year will also be Critically Dry, and a 64 percent chance that it will be Dry or Critically Dry — not favorable conditions for water management. In all, there’s a 71 percent chance that next year will be Below Normal or drier and only a 29 percent chance of experiencing an Above Normal or Wet year. Years with dry conditions (critically dry, dry and below normal years) are likely to be followed by dry conditions for three reasons. First, dry and wet patterns are driven by climate mechanisms that commonly extend over several years, often decades, making it more likely that any one year will be followed by one like it. Second, low moisture levels from a previous dry year will absorb some moisture in later years to reduce runoff. Third, a portion of the California Department of Water Resources index used to define a water year depends on precipitation from the previous year, which increases the likelihood that the following year will be like the previous. Even when annual flow data alone are used — eliminating the DWR index’s dependence on the previous year — critically dry years are more than twice as likely to occur if preceded by a critically dry year. The news abounds with hopeful statements about Pacific winds and sea surface temperatures heralding an El Niño. The periodic shift of warm water from the Western to the Eastern Pacific [known as the El Niño Southern Oscillation (ENSO)] is linked to weather extremes over much of the globe. Meteorologists have long noted that intense El Niño events are commonly associated with high precipitation in Southern California. Though, historically, odds are against improved water conditions next year, an El Niño could end California’s drought. 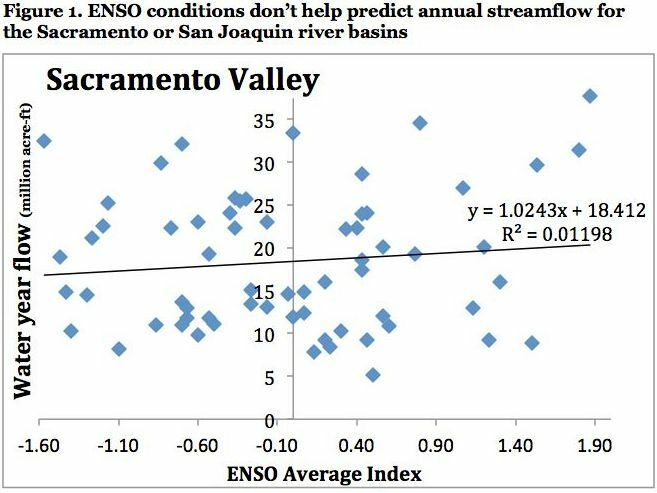 The relationship between the ENSO index and annual runoff in the Sacramento and San Joaquin river basins since 1950 is plotted in Figure 1. Although ENSO may signal significant weather changes elsewhere in the world, it has little predictive capacity in Northern California where most of the state’s precipitation occurs. (It has better predictive value for Southern California). Note in Figure 1 that three of the four largest ENSO events are associated with very wet conditions. Two of these – water years 1983 and 1998 – were record-breaking wet years. This seems to offer a glimmer of hope. But the numerous dynamic and statistical models that predict ENSO conditions into the new water year have positive, but disappointingly weak ENSO values. An El Niño may turn out to be closer to La Nada if the projections of these models bear out. During a severe drought, water managers and regulators must balance water deliveries in the current year against saving water for unknown conditions in coming years. It is statistically likely the drought will continue into next year. We all hope wet weather returns to California soon. But, given the odds, it makes sense to prepare for another dry year. Jay Lund is a professor of civil and environmental engineering and director of the Center for Watershed Sciences at UC Davis. Jeffrey Mount, a UC Davis professor emeritus of geology, is a senior fellow at the Public Policy Institute of California. This entry was posted in Uncategorized and tagged drought, Jay Lund, Jeffrey Mount. Bookmark the permalink. 22 Responses to Will California’s drought extend into 2015? That R-squared tells the story, doesn’t it? What would Figure 1 look like if the dots were linked for sequential years? Pure statistics do not tell the whole story unless you are studying something that is truly random. But weather patterns are not entirely random. See for instance http://www.fixcawater.com/climate-variability.html for a history of climate variability (that is heavy on geologic input) and at least partial explanation for this variability. As pointed out by Lynn Ingram in “The West Without Water”, El Nino’s tend not to cause wet winters in California unless the Pacific Decadal Oscillation (PDO) is in its positive phase. Also the last long dry spell in California, in 1976-77, coincided with the PDO flipping from negative to positive. In the long period of positive PDO that followed, there were two very wet El Nino events, in 1982-83 and 1997-98. However, for most of this century the PDO has been negative and a really big question has been weather or not it would flip again, coincident with the long dry spell. See http://jisao.washington.edu/pdo/PDO.latest for the answer, which is, yes, it has. Therefore, throw out the statistics and get out the sand bags! That was supposed to be “whether”, not “weather”, in the third last line. I must have been under it. The post references an essay by Vít Klemeš (2000). I commend to all “hydrological” practitioners the essay and indeed the entirety of the publication in which it appears. Even granting there be some statistical indicator of 2015 being critically dry, this is not actionable information. The costs associated with presuming either near-certain continuing drought or near-certain resolving of the drought are both too great. They should have been repairing and renewing those 100 year old water pipes all along. Money is always used for less important stuff until a disaster comes along then they realize what they should have been doing. Look how many old pipes have busted and water wasted so far- millions of gallons, and they want to fine us for using a little water ? Hypocrisy. We get computerized drones to bring water to us. then we desalinize like our 3D world countries are ahead of us at. Lot’s of talk and zero action is the stupid way to go. Anyone who has credentials dealing with this that does not take action, is going to look like a failure in two years. I’ve got your names and then I will make an example of your idiocy. Start building desalinization facilities NOW. Start making water delivery by self driving vehicles NOW. Don’t wait and then cry about your misfortune. Do it Now.